When your tile and grout gets dirty it changes the look in your house and we know how hard it is to clean it, specially in those areas where the most traffic concentrates like the kitchen, bathrooms, entryways, living rooms and hallways. Let us do the dirty work for you no job is to small or to big for us. 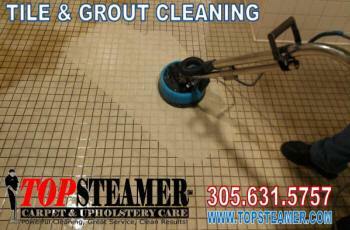 Top Steamer is now offering in its line of cleaning services professional tile and grout cleaning in Miami. 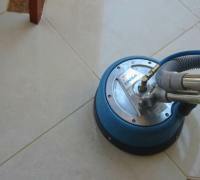 We use the most advanced system to clean your tile floors without causing any harm to the tile or to you. Our professional trained technicians will do a walk through with the customer to point out areas that need special cleaning. 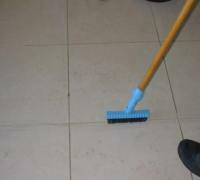 Then use a special tile and grout cleaning agent to loosen the soil in the grout joint and on the surface of the tile. Then we use special equipment with very hot water to remove the dirt and grime. Then we apply a floor care neutralizer to prepare the grout for sealing. We recommend having the grout sealed with our penetrating sealer. This extra layer of protection seals the grout making it resistant to spills and stains, and easier to clean in the future keeping the grout and the surface looking great longer. We use a powerful three step deep cleaning process to remove all dirt from your tile and grout. First we do a pre-spray to your tile and grout with a special formulated cleaning solution to loosen all dirt, hard water deposits and previous cleaning solution residue. After we let the cleaning agent performed its work on the tile and grout, we move to the second step where we use a powerful rotating brush to agitate the cleaning solution on the tile, to remove as much dirt embedded on the gout joints and tile crevices. This is a necessary step to get the tile floor as clean as possible. 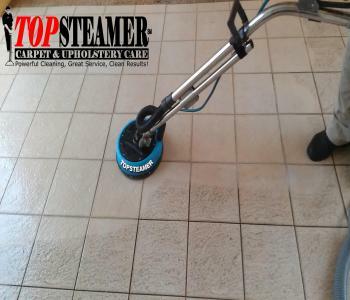 For the third and last step in the tile cleaning process, we use a high pressurized tile and grout cleaning machine to remove all dirt, cleaning solution from your ceramic tile floors, leaving a sparkling, freshly clean tile and grout. We recommend getting your tile and grout sealed after we deep clean it for a longer lasting clean looking tile and grout. Watch a short tile and grout cleaning video below and see how our deep cleaning process removes years of dirt. See How Our Powerful Tile and Grout Cleaning Removes All Dirt, You Wont Believe The Difference! We also can provide you with Tile and Grout cleaning in your office, building, clinics, schools, hi-rises, hotels, stores, day cares etc. We have the right equipment for every cleaning needs, no job is too big or too small for us. We treat all our customer with respect so you can be sure you made the right decision in choosing our services for your Tile and Grout cleaning needs. Please feel free to request a free estimate in our contact us area of our website, and one of our customer care representatives will be gladly to contact you. Visit our FAQ section about tile and grout cleaning in our website to find answers to questions you may have. If you don't find your answer please email us with your question and we will be gladly to provide you with answers to your questions. Call us for a free no obligation estimate, all our services are back up with our 100% Customer Satisfaction Guaranteed. If its not clean to your standards we will re-clean the area again for FREE! no questions ask. Call us now to scheduled your appointment 305-631-5757. For the cleanest tile and grout in Miami this is the place. See what our customers have to say about us. I had just purchased a condo and the tiles were filthy. As someone who hate wearing shoe in the house, it is crucial for me to have spotless flooring. Their online booking was super convenient for me as I do most of my business abroad and in a time zone that is complete opposite of Miami's. When they got to my apartment, they spent about 4 hrs on my floors. They scrubbed everything down first, then steamed the floors and finished with mopping. Expectations exceeded. I will use them again.